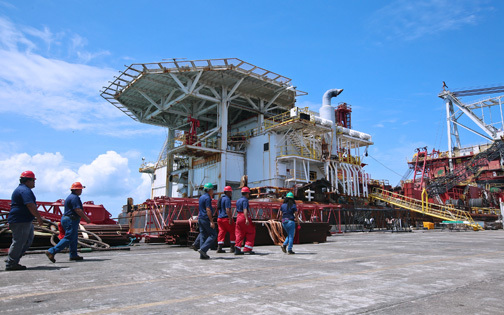 The Lone Star, a pipe-laying barge retired from use, is already docked in the MER facilities in Ceiba for dismantling and recycling procedures. The Marine Environmental Remediation Group, flanked by Puerto Rico government officials, announced Wednesday the agreement to establish a new ship recycling facility in the marine port of the former Roosevelt Roads U.S. Naval Base located in Ceiba. With an investment of approximately $12 million, the project represents “a new era for safe and environmentally sustainable marine recycling operations” that will employ about 500 people in the next two years, company officials said. “MER is committed to help propel the island’s economic development in a ‘green’ and safe manner. To achieve this, we have carefully crafted a culture of safety and concern for our people and the environment and taken the extra steps needed to ensure that all of the most stringent international regulations are not only met, but exceeded,” said MER CEO, Martin Vulaj. “Today MER and Puerto Rico are setting a new world standard for international ship recycling that marks the beginning of a new era for environmentally sustainable operations and industrial development,” he said. The new facility will focus on the reclamation of steel and other metals recovered using state-of-the-art “green” technology, and the re-selling of vessel machinery and equipment recycled from sea-going vessels and platforms, which have been retired from use. Operated locally by MER Group Puerto Rico, the MER Group U.S. East Coast/Caribbean Facility has been established on land leased from the Roosevelt Roads Redevelopment Authority. The lease agreement authorizes the use dock #3 of the port and other facilities for the operation. The Authority has also been working closely with the company to facilitate the permitting process required for the operations. “We believe that the establishment of operations by MER Group at our facilities will contribute to creating jobs and stimulating economic activity in the towns of Ceiba and Naguabo, and the eastern region of Puerto Rico,” said Authority Executive Director, Malu Blázquez-Arsuaga. The recycling operations will employ technological innovation and patented proprietary procedures, which significantly reduce risk to the environment and the safety of personnel associated with conventional ship-breaking activities. MER has pioneered an environmentally sensitive process of dismantling obsolete vessels that meets or exceeds all U.S. EPA, OSHA, state and Commonwealth regulations. These standards will also become the required performance levels for European Union-flagged and owned ships under the new EU Ship Recycling Regulation. Hello I am following up on my application for work at your facility, i have taken two applications to the security guard at the facility. Hey Buddy!, I found this information for you: "MER Group opens M ship recycling facility in Ceiba". Here is the website link: https://newsismybusiness.com/recycling-facility-ceiba/. Thank you.